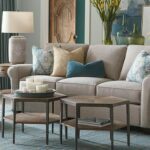 Bassett furniture has been in operation for more than 100 years, operates 50 company owned retail stores, and is as dynamic of a furniture brand as you’ll find. Their vast selection of styles and price ranges help meet the needs of any professional home designer or personal redecorating checklist. Bassett Furniture is among the few major furniture brands that offers direct-to-consumer sales—meaning you can buy their products directly from their website without going through any middle man! Bassett affords a keen eye on developing market trends and have been proving themselves for the last 100+ years to be an efficient trendsetter and design spotter. Regarded by many as one of the best furniture brands in the world, Bassett offers many products priced at a level accessible by most consumers—but with more style and quality of materials than most artisan brands are able to muster. Bassett Furniture’s sheer size and many years of experience have afforded them a powerful eye for design trends, and the ability to develop furniture that will remain relevant for many years. Sharp colors and shapes are found on their accent pieces while powerful neutral tones and richly-textured upholstery can be seen on their sofas and chairs. Bassett understands that when you shop for furniture it isn’t like shopping for a car—the furniture you buy affects your entire home and has the potential to brighten—or dampen—your daily moods. Bassett furniture has many entire collections of furniture that work together to form a harmonious presence of utmost style and functionality that can afford a single room style, or be matched across and entire residence. In addition to their amazing catalog of stylish and affordable upholstery and case goods, Bassett also offers some tremendously unique products such as the Cross Buck Live Edge cocktail table from their Bench Made lineup. Bassett is a firm believer in responsible and domestic manufacturing, and while they source materials from all over the globe—their products are manufactured and finished entirely in the United States. Their products are leading examples for designers across the world, and their success as not only a brand but as a thought-leader in the furniture industry has helped them earn a place among the best furniture brands around. Bassett has forged some truly powerful partnerships in their time in the industry, pairing them not only with powerhouse brands like HGTV—but also to unique manufacturing processes like their solid woods Bench Made lineup. Bassett’s Bench Made furniture is manufactured in their Virginia facilities, and utilizes the harmonious beauty found in Nature to exude style from withing. This approach is characterized by natural edging, and ‘live’ edges on slab-cut furniture tops. There has been a great revival in appreciation for natural and reclaimed furniture within the past several years. Many designers associate this trend with (or maybe because of) Restoration Hardware’s meteoric rise to stardom within the design world. Restoration Hardware makes use of artisan crafting techniques and limited finish runs based on availability of reclaimed woods. Bassett has clearly paid close attention to this growing demand by consumers, and their Bench Made branch offers a tremendous lineup. 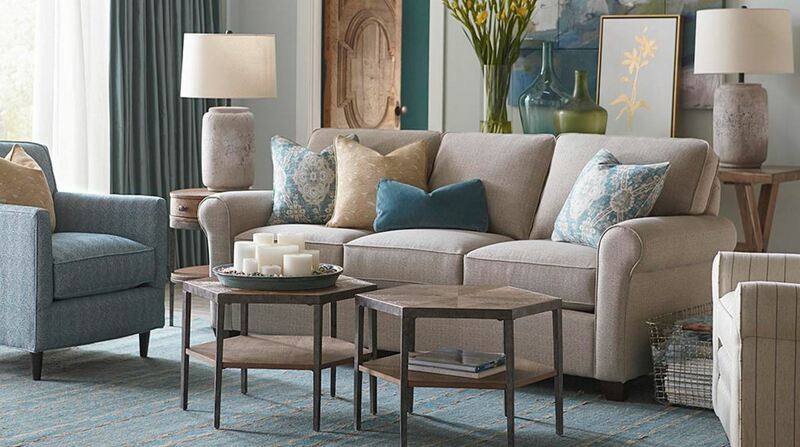 Bassett Furniture is also one of the most highly-customizable brands in the world—meaning that nearly every piece in their catalog can be tailored to your preference. Their stores are often integrated with Bassett Design Centers, which are studio-type locations where you can swap materials, change design specs, and customize their furniture in nearly anyway imaginable. The have partnered with HGTV to offer Design Studios that offer design assistance for interior decorators, or anyone that wants to have their furniture tailor-made to fit uniquely in their home. The resulting effect of these tremendous service offered by Bassett is that for very little extra, you can find furniture that has been designed by one of the sharpest group of designers in the industry—and also is one-of-a-kind. Bassett’s commitment to customization and unique materials have helped them maintain a position at the leading edge of the furniture industry both in terms of quality of design and quantity of sales. Bassett Furniture is available for purchase directly through the Bassett website, and there you can even find deals on clearance items that are up to 70% off! If you are looking to purchase locally from a furniture dealer, you can visit their store locator page to find the closest Bassett store near you. Bassett Furniture is also found in many non-Bassett owned stores, and those locations should appear on their locator page as well. Bassett also has a spin-off accents company named Basset-Mirror which—you guessed it—features accent pieces that are heavily laden in mirrored panels and accessories. Bassett Mirror products can be found for purchase online through such retailers as Wayfair, and can even be found on Amazon as well. Bassett Mirror offers furniture, mirrors, accent table lamps, and many other niche-home decor items. These products are all made with the same oversight afforded to Bassett Furniture, and can be found for a steal online! Another noteworthy lineup of Bassett-related products is the Bassett Baby Collection, which can be found on Wayfair as well. Bassett Furniture is available for purchase directly through the Bassett website, and there you can even find deals on clearance items that are up to 70% off! Furniture brands come and go with trends and the years, though a select few have remained steadfast for hundreds of years—still providing unbelievable products and service. Bassett Furniture got it’s start more than a 100 years ago in the hills of Virginia, and continues to this day to define excellent design and customer service. Their design centers offer buyers an unparalleled degree of customization options, and products lines such as Bench Made have secured Bassett Furniture among a short list of the world’s best furniture brands. Buying furniture online has opened up an entirely new world to buyers; middlemen are no longer a plague on budgets, and you can regularly save 40% on the same furniture you will find in local stores. The sea of options is immense, and without knowing the brands you’re buying from you run a very real risk of ending up with horribly-made furniture that will fall apart quickly—just through normal wear-and tear. Brands like Bassett Furniture offer tremendous quality at affordable prices, and can help you liven up your lifestyle and provide your home with a unique spark of design harmony! Bassett Furniture is one of the best furniture brands around, and offers a wide range of furniture and upholstered goods such as sofas and couches. They offer direct-to-consumer sales, and have partnered with such brands as HGTV to offer Design Centers where buyers can completely customize their products.